As long as the sport of soccer has been in existence, opposing coaches are always searching for new ways to gain an advantage. Strategic player positioning on the field, or formation-experimentation, is one of the areas that has been exploited the most. You would expect that everything that could be known about team player formations would already be known by now. In the early 2000s, a new system evolved and has since spread throughout the world. It’s called the 4-2-3-1 formation. The 4-2-3-1, in its simplest form, originated in the late 90’s and early 2000’s. Prominent European club teams started using it regularly in 2010 and by the 2012 Euro tournament half the teams participating used the formation, including hosts Poland and semifinalists Germany. So why is it so useful, so popular and so common for teams to apply it? For one, it’s amazingly versatile. In big-money international soccer where expensive players are forced to integrate into new systems quickly, the 4-2-3-1 has defined roles that enable a player to quickly gel with his new team. This hides the fact that the player has had little time to train with his new teammates and gets him up and running quickly. Midfielders, wingers, defenders and strikers all know their job, and due to the vast area of the field that the system comprehensively covers, it’s a great shape to use. Goals are often scored at the beginning of games or immediately after halftime when teams haven’t yet settled into a rhythm. At these times, a team is most vulnerable. The 4-2-3-1 allows a team to safely establish an early rhythm to the game and feel out an opponent without risking too much. Fast-forward to 2015 and the 4-2-3-1’s flexibility and attacking power is fast becoming the formation of choice for leading coaches all over the world. Even USA soccer where both pro and college league coaches have the luxury of choice and time on their side, the 4-2-3-1 is becoming the go-to default formation. The beauty of this system is that there are four lines that interchange freely. This formation can be very successful if all players do their part on the soccer field and cover their zone in defense. 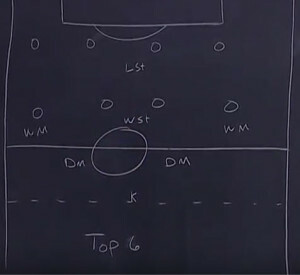 As with most popular formations, there is a back 4 defensive line (2,3,4,5) and the players have similar roles as they would with any other formation. That, however, is where the similarities end. It is able to stop an opponent’s entry pass (6,8 act as a screen in front of the back 4). It is able to stop most goals from where they originate. That means, it’s able to smother shots from 12-16 yards out. Most formations employ a lot of flexibility on offense. The 4-2-3-1 does this too, but is surprisingly flexible on defense as well. To protect leads, the 4-2-3-1 can easily become a 4-5-1 when the midfielders change their roles to be strictly defensive. 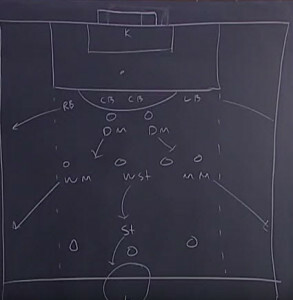 The 4-2-3-1 system of play can be used against most other soccer formations and the strength of this formation lies in the midfield and overlapping outside defenders (RB and LB or 2,3,7,11 in the diagram) who are given a lot of range not only in defense, but also on the offensive side of the ball. All coaches in every sport understand that a good offense arises from a good defense. As well as the 4-2-3-1 is a formation that offers great cover defensively, it is one of the emerging systems of play that provides a more potent attacking style. 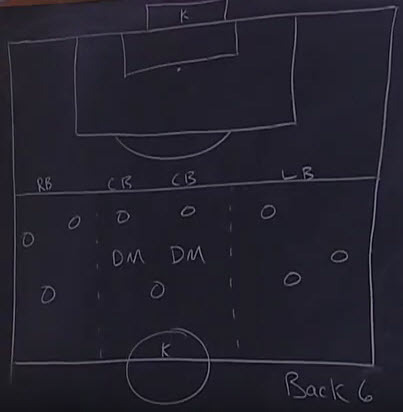 Although it may seem like a defensive formation and it is very strong defensively, when going forward this formation turns into a strong offensive 4-3-3 if everyone is doing their job. The 4-2-3-1 gives a team defensive stability in the middle as well as a compact unit with the ability to attack in wide areas. There’s one defined striker so at first glance goals look like they might be hard to come by. Don’t be fooled! Although it may come off as defensive-looking to the untrained eye, this formation can be very powerful going forward. 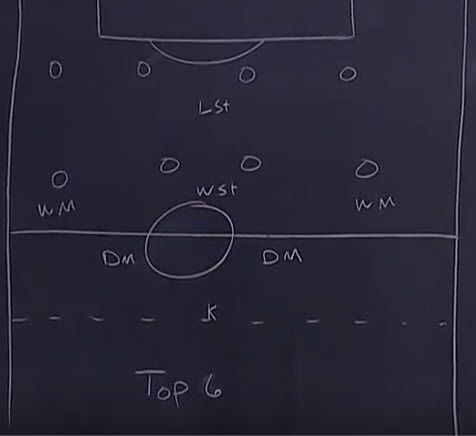 If hitting a team on the counter, the wide players fly up the field and the center mid (WST in the diagram below) also joins the attack giving this seemingly defensive formation an instant transformation to offense. Tactically, the wingbacks (2,3) get more offensive opportunities in the 4-2-3-1 than they would in any other formation. They can freely travel up the wings during a building attack and are reinforced, if necessary by the wide-midfielders (7,11) who are among the players with the most responsibilities on the entire field, both offensively and defensively. The one true offensive-only player is the lone striker at the top (9) who interacts closely with the center-midfielder, 10. As most teams play a 4-4-2, which is a zone type of formation, the interchangeability of players in the 4-2-3-1 causes the 4-4-2 a lot of marking-up confusion. When on full attack and with a slight change, the 4-2-3-1 actually resembles a 4-3-3 formation when 7,9, and 10 become all-out attackers supported by a midfield of 6,8, and 11. 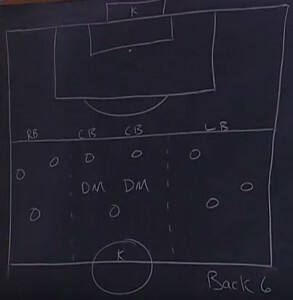 Unique to the 4-2-3-1, as opposed to other formations, is that players have specific jobs they must execute in order for it to work as the well-oiled machine it can be. Different lines have different responsibilities. So how do you teach a new system to players that are most familiar with other formations, particularly the 4-4-2, so that they can simply pick up new job responsibilities quickly? Begin by teaching this formation from a defensive standpoint. Why? No matter what formation you wish to use, coaching can have a bigger impact on the defensive side of the ball. Defending is a more controlled situation. That is, it is usually easier to control the opposing offense rather than trying to work your offensive presence against an opposition’s defense. So use the defending side of the ball as your departure to venture off into teaching a new system and build outwards from it. Break things down into a front 6 and a back 6. See the video – Coach Butch Lauffer from the Texas A & M men’s soccer team will explain how to implement the 4-2-3-1 using the Back 6 defensive approach. Notice the 6 defenders consisting of two defensive midfielders, two backs (right and left) and two center backs. Draw a restraining line in front of the back four and then divide the field into 3 vertical zones. In this exercise the defenders may travel anywhere into any zone they wish. The 9 attacking players “O” are divided into 3 zones and may not leave their specific zone. During this drill, defensive players try to stop goals and the offensive players try to score goals. Now, “O” players, if they break the restraining line, are allowed to go to goal and score if they can. As for the defending team, no matter what the zone, the defense must outnumber the offense 4 to 3. So the 4 closest defenders must pressure the ball. The remaining defenders fill in the spaces left by the 4 using what are called “Angles of Recovery” towards the play. How should the defenders best travel and work with each other? Simply by creating a defensive “box”. Now let’s take a look at the top 6 which is used for teaching and practicing on the offensive side of the ball. The situation is simply “flipped” from what was seen in the exercise for the back 6. The objective is that the defensive 6 should not give up goals and should try to score. The 8 “O” players should not give up goals and at the same time try to break down the defensive 6. When possession is lost, defensive players must get behind the ball as quickly as possible. The lone striker (LST) should force the game wide as soon as possible when possession changes. This is accomplished with pressure to the WM in order to force the team wide. When the defense wins back the ball, it should pass to the “highest line” and then support quickly. This takes out as many opposing defensive players from the game as possible. Where does the 4-2-3-1 fall short? Weakness for this formation in soccer comes from three attacking midfield players forgetting that they have to defend and slacking off when transitioning to defense. One of the biggest challenges when coaching young players is getting them to stay in position. Time and again, you see them charging for the ball before huddling around it in a clumsy effort to get a kick. Even senior players can succumb to over enthusiasm, creating huge gaps for the opposition to exploit and break through on goal. Coaches should always set the formation to suit the players they have and not the other way around. Players need to play with speed and make correct decisions. 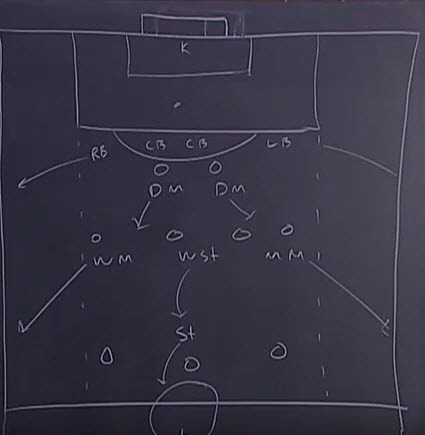 If you’d like to learn more about the 4-2-3-1 formation, we highly recommend Butch Lauffer’s DVD – Tactical Flexibility with the 4-2-3-1 Soccer System. Rob Smith is a life-long soccer player and coach. A former high school New Jersey state champion and division III college player, Rob has several years of experience coaching youth teams. He currently plays in competitive men’s leagues in Philadelphia. A big soccer fan, he enjoys teaching the sport of soccer to all levels. Rob graduated from The College of New Jersey and Thomas Jefferson University in Philadelphia with a degree in Microbiology/Immunology. In his spare time he enjoys backpacking, scuba diving, and traveling to new places. Thanks Rob. How can we coach towards this formation at the small-sided youth levels, where we’ve been playing with 8v8, and now, with new recommendations, it looks ilke a 7v7 or 9v9. The 4-2-3-1 is an advanced formation that is not typically used below the high school level. However, if you want to give it a try with younger players and they are receptive to the responsibilities of playing in this kind of a layout then certainly go ahead. For the sake of training in a small-sided system, you can use variations of the 4-2-3-1 with a couple of caveats. The 4-2-3-1 is a defensive-first formation, so keep that back line strong. If playing with 9 players I suggest starting with a backline of 4, which means your final formation would be a 4-2-2-1 and you would remove one of the forward midfielders. If playing with 8 go with a 3-2-2-1 and with 7 maybe try a 3-2-2-1. Make sure the wings (both fullbacks and midfielders) understand they have both offensive and defensive responsibilities. The main key is to keep the fidelity of the relationship of the 2 center fullbacks with the 2 mid-backs right in front of them (so that they can travel as a defensive “box” unit as described in the article, and outnumber their opponents on the wing by 1. Experiment within those parameters and position your players as you feel best.